Suppose you come up with an ad that says some bad things about some type of crowd. This crowd also happens to be your primary target of your campaign. You must be doing something wrong, right? But what if you’re right? What if that target group is actually doing something wrong and you can offer them the solution? The Motrin advertisement: 27k views in 21 hours. That would be great, unless you’re wrong. And when you’re wrong in these days, people will tell you that you’re wrong. They won’t only tell you that you’re wrong, they also use the power of the internet to tell everybody that you’re wrong. This is the case of Motrin. The pain reliever that made a serious mistake. Motrin produces products for pain relieve. They recently launched an advertisement campaign in which they target fresh moms that just gave birth and like to carry their baby. Strapped on the body that is, with one of the thousand kind of solutions there is in the market. Their conclusion about these products: They look absolutely fancy, but it causes pain. And for this pain, Motrin has the pain relieve solution. But what if your target group doesn’t agree on the statement you’re making in your advertisement. In the old days – way before social media – people didn’t have a voice. They could only spread their opinion to the neighbors and their coworkers. Nowadays, messages spread like fire. In this case, people joined forces. Trends on Motrin, Motrinmoms, Apple and Microsoft. Click to enlarge. Above are the results on a Motrin search in Twitter trends. As you can see, before 16th of November, Motrin didn’t get any attention on Twitter. Apple and Microsoft are added in the graph to show normal conversations about a big brand. At the 17th of November, Motrin got some huge spikes which even got higher then Apple. And that’s not really a small thing. 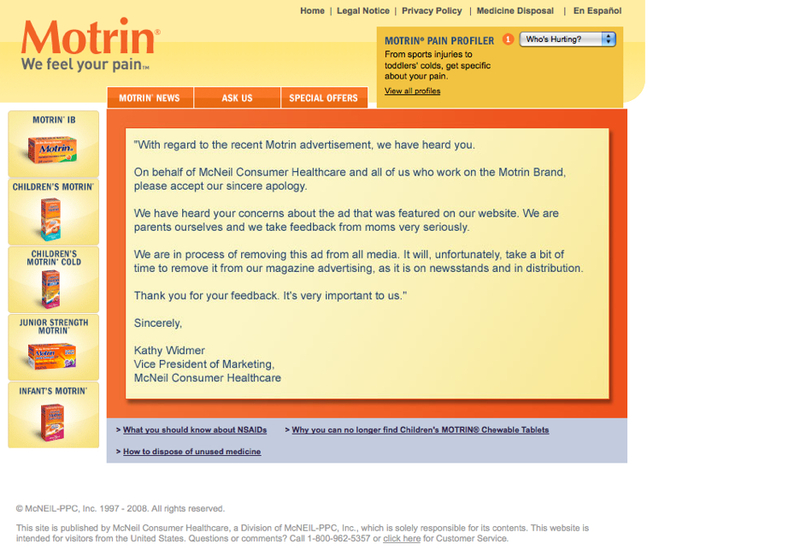 Angry moms totally disagreed on the statement by Motrin. Their sweet little baby did not cause them any pain. They gave nothing but pleasure. The advertisement was a total farce and didn’t even come close to the truth. And when you don’t want to hurt moms, you shouldn’t tell them that their kid causes them any extra pain. Because you will see what will happen. Just like in this case with Motrin. Moms joined forces on Twitter, discuss the topic on advertisement on Youtube and even got their voice so clear to Motrin that they entirely stopped the campaign. Insights in the buzz around the advertisement: 12k views in 1 day. The contribution above was posted on YouTube and gives a fair overview of the case in a few minutes. Pay close attention to the way women reflect their emotions on an advertisement. And these consumers totally right. What’s the lesson learned from this case? Always do a test with your target audience. Telling them they’re doing something wrong (and you have the solution) is one thing. But if its all a lie, you’re absolutely making the crowd upset. And if there is one thing you don’t want happen, is a crowd being negative about your brand online.